Several species of Roaches are commonly seen in and around homes, businesses, and lawns alike here in Florida. These pests are not only an annoyance and a nuisance, they are a health hazard as well. They are known to transmit disease and spread bacteria. Of the many different species of roach, several of these are noted below that we most commonly encounter and take care of. Common treatments for one species of roach normally are not as effective for other species, so identification of the proper species of roach can be key in getting control and elimination of them. Therefore, contacting the professionals to identify and form a treatment plan is suggested when a roach issue has been encountered. The American Cockroach, commonly referred to as Palmetto Bugs are known to be Florida’s largest of the roach species. They can grow to about 2.5” in length and are characterized by their large size, their black/brown color, with yellowish/black markings on the top of their head. This species of roach is found year-round in most areas of Florida, with increased activity in the warmer months during the summertime. They prefer to be out and about during the night hours, as they forage for food and water. American cockroaches take up home in areas close to water sources, as well as in humid, dark areas where shelter, food, and water is near to them. They live in sewer systems, garbage disposals, and other dirty and dark areas presenting them with a moist, nutrient-filled area to thrive. Many times these roaches will make their way inside the home through a crack in the doorway, a hole or void in a wall space, through the sewer lines, or because of a water source openly available to them. Many times we have seen these roaches become a problem when an old or faulty pipe is leaking beneath the foundation of the home. 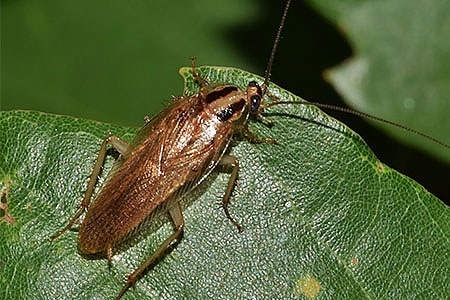 American roaches are known to carry bacteria with them from the unsightly areas they are known to live and forage in, and can be a risk to health if the roach problem becomes bad. E. coli, salmonella and other bacteria have been linked to them. Treatment for American roaches differs depending on location and severity of the issue at hand. The German cockroach is the roach seen the most in Florida. They are much smaller than the above mentioned Palmetto bugs, as they are typically about ¼ to just over ½” in length. These can be identified due to their small size, their gathering in larger numbers, and their two parallel bands (black in color) running down just behind their head. This species of roach is also primarily active at night, and takes up residence in dark, moist areas that provide them with a suitable water and food source. They willingly feed on many things humans mistakenly provide for them, such as pet foods, crumbs, grease, open cardboard boxes, garbage, and leftovers, etc. These roaches transport bacteria just as the American roach does, and can pose a health risk in terms of allergies as well for some humans. Treatment and control of this species of roach is gained through several treatment methods depending on the location and severity of the roach issue. They normally require extensive treatment and can become a bad problem in a short amount of time if left untreated. The Brown-Banded cockroach is a roach that grows to a normal size of about ½” long and has an oval-shaped body with two light colored brown bands going across the body of the roach (on the wings of the adults). These roaches are look similar to other roach species, but their slightly rounded, oval-shaped body helps to identify them. These are known to trigger allergies and can even cause diarrhea and stomach problems due to the harmful bacteria they are known to carry. These roaches transmit germs and bacteria as they travel, making them a potential threat to our health if left untreated.